3 Best Engine Oil Stop Leak Additives – Do They Work? What is a Stop Leak Additive? An stop leak additive is a non-solvent chemical formula containing a blend of friction modifiers and other refined petroleum products. Mileage, age, heat and pressure can cause engine gaskets, o-rings and other seals to shrink, harden or dry up. This may cause holes, cracks or spaces to develop through which oil can leak. Additives are designed to reduce the amount of oil that bypasses worn seals. The various seals, o-rings and gaskets in an engine will eventually begin to dry up and pull away from surfaces. When this occurs, a leak can develop. The concept behind these additives is to revitalize seals so that they return to their original size, shape and flexibility to minimize or stop any leaks. The first engine oil sealant formulas were designed to clog the hole through which the oil was leaking. Some of the first patented oil stop leak products were basically castor oil containing ground nut shells. The ground shells would flow to the point of the leak and then clog the hole. The problem with these additives as well as later formulas containing sawdust, aluminum shavings or other additives was that the particles would clog other areas. These oil particles also increased engine wear. Although good in theory, these particle-containing oil additives usually caused more damage in the long term. Instead of particle-clogging substances, later versions of additive products were formulated from petroleum distillates that would swell the gasket or seal. This would cause it to seal properly and stop the leak. The problem with these chemical products was that they expanded the defective gasket for a short time while causing all the seals or gaskets in the engine to deteriorate more quickly. As a result, it was possible to worsen the original leak and cause other leaks along the path of the formula. 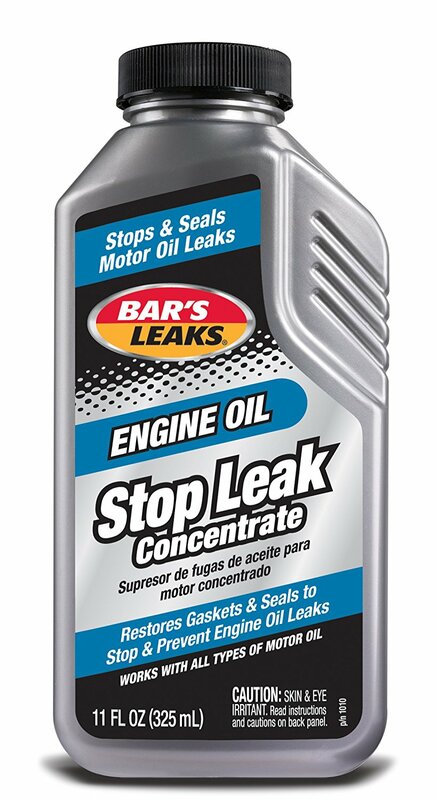 Lucas Engine Oil Stop Leak 1 4.3 $$ See Latest Price! BlueDevil Oil Stop Leak 2 3.5 $$$B See Latest Price! Bar’s Leaks 3 3.3 $ See Latest Price! The best formulas are products that do not contain particles that clog your engine or petroleum distillates that can deteriorate existing seals. The best stop leak available on the market is one specifically designed to be absorbed into all the seals in the engine. They expand and revitalize the components back to their original size, shape and flexibility without causing future deterioration. Pour one 8-ounce bottle into the oil sump or crank case to treat 4 to 6 quarts of motor oil. Start engine and operate it for one to two hours or until the leak has stopped. Two days of driving may be required to seal extensive leaks. This product can be used on refillable shock absorbers, gear cases, axle seals, gearboxes, pinion seals and gear differentials. DO NOT USE THIS PRODUCT IN BRAKE SYSTEMS OR ON PAINTED SURFACES! CAUTION! Avoid contact with your skin. Keep the product out of reach of children. Always use protective eyewear when using this product. DISPOSAL: Dispose of used motor oil and oil additives in accordance with all local, state and federal regulations. The additive is specifically formulated to stop and seal oil leaks that are caused by normal engine wear and age. In addition to stopping existing leaks, it can help prevent future problems by conditioning and restoring engine gaskets and seals. It works with all types of gasoline and diesel engines using conventional, high mileage or synthetic oil. One bottle treats up to 5 quarts of motor oil. On smaller 4-cycle engines use approximately 2 ounces of Bar’s Leaks for every quart of oil. Add a full bottle to the engine at or between every oil change. Do not overfill. Leaks typically stop within 200 miles or three days of driving. If leaks continue, a second application may be required or mechanical attention is needed. Additives work depending upon the situation. They can temporarily stop or minimize a slow leak. This enables individuals who do not have sufficient funds to fix the underlying problem to drive or operate the engine until they can get it fixed properly. Sealants do not have the ability to stop large leaks if the gasket or seal has a outsized hole, gap or breakage. In these cases, the seal must be replaced. While these additives have not been shown to cause harm to an engine, a better option may be to use “high-mileage’’ oil. These oil formulas contain additives designed to keep engine seals flexible and help prevent small leaks. Rather than trying to stop a leak by sealing it from the inside, a better option is to seal it by spraying a product on the outside. Whenever you have a leak, it is essential to use the best long-term auto repair solution, which is to replace the leaking gasket, seal or o-ring. There is no such thing as a miracle in a can. Using these oil additives is like giving your car drugs. They may mask a problem for a while, until they have a “withdrawal” and cause a much larger problem, which will require more money to correct. The best solution is to get the leak fixed properly as soon as possible. Additives are only a temporary fix. We’re interested to know – have you used an engine oil additive before? If so, did it work? Let us know by leaving a comment below! 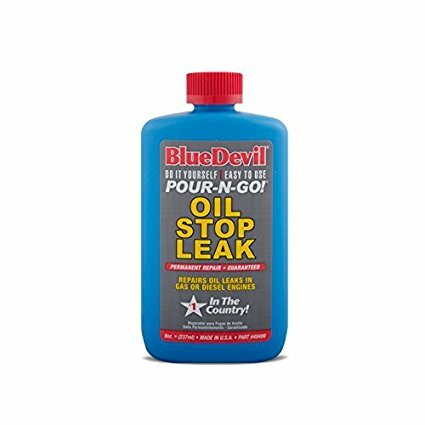 I used blue devil oil stop leak in a 1936 Chevrolet, it practically stopped the leaks. I’m planning on trying Lucas stop leak on my 292 Y block that seems to have a very small leak near the rear main bearing.